You can buy magnetic fishing toys for children but it's much more fun to make your own. There are two stages to this project, creating the fishing pond and then your fish. My toddler wanted to be as involved as possible in making his new toy so we started with the fish pond. Squirt some blue paint onto a dish and let your child paint as much or as little as they like of the blue paper. You will need enough paper to cover all four insides of the box and the base. 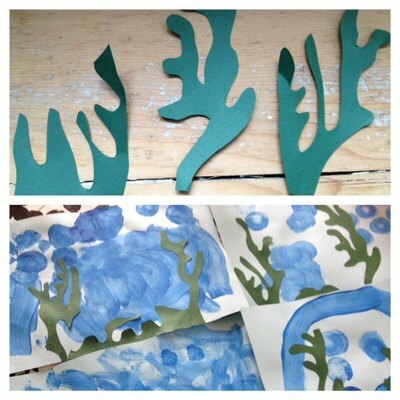 When the paintings are dry, cut out some wiggly shapes from the green paper to look like pond or seaweed. Glue the weed shapes on four pieces of paper and reserve one piece for the bottom of the pond. 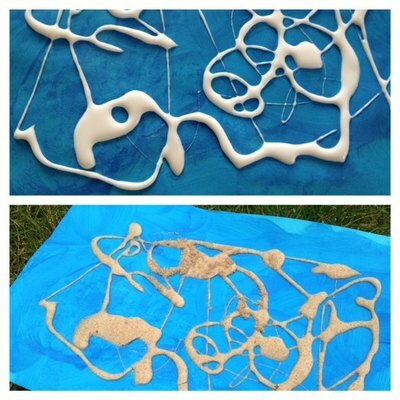 On the piece of paper you are using for the base of your pond, squirt out some glue in a random pattern and then sprinkle on plenty of dry sand. Leave to dry. Glue the paper with the weed around all four sides inside your cardboard box. Glue the sandy bottom to the inside base of your cardboard box so you now have a fun underwater world ready for your fish. Next you need to create some fish or other underwater creatures to catch. My son wanted red fish, a starfish and a jelly fish. I tried a few different techniques and he guided me in the colours he wanted. Older children will be able to make these themselves. Fold your felt in half and draw the shape of your creature. Cut out the shape and you should have two identical pieces. Glue or sew the washer part way into one side of your underwater creature. Glue or sew the other half of the felt on top. If you want to give it more body then you can leave a little gap and fill with some wadding before sealing up. 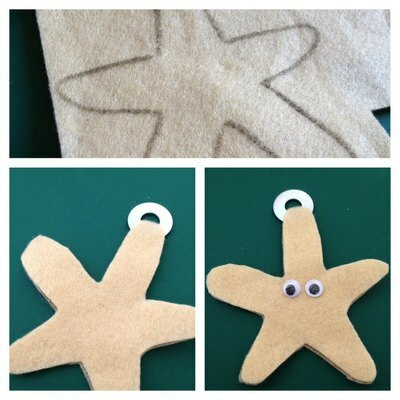 Decorate your creatures with scraps of felt or googly eyes. You could use other materials as well. We used some gold streamers to make wiggly legs for the jelly fish and glued them in before sealing him up. Finally, you will need a rod to go fishing. Tie a piece of string at the end of a chopstick and again at the other end. We used an old string handle from a present bag. You could also use a stick if you don't have an old chopstick. Glue a magnet to the end of the string and wait until it's fully dry before playing. This is a great game to encourage concentration, dexterity and patience. You can also adapt it with various challenges. We have been practicing counting and colours at the same time.